Narrative: The mortarboard is an academic cap worn on formal occasions by the faculty or students of a college or university. Mary Somers b. 5 October 1905 on the occasion of her graduation from Mount Saint Bernard Ladies College, Antigonish. She graduated from MSB and was the recipient of several awards throughout her academic career including honours in English, Latin, and History. She worked as associate editor of the school's publication, "The Memorare" and also made several submissions as a poet. After graduating from MSB High School she attended St F X College graduating with a BA(1924) she obtained a teaching license in and taught at MSB, Havre Boucher, Antigonish and Cape Breton County schools. Mary also received her Masters in Arts from the Catholic University of America in 1935 specializing in Social Services. She did her masters thesis on the "Little Flower Orphanage" in Bras d'Or Cape Breton. Mary maintained an active interest in the history of her family, community and church. She married Hilus Webb and raised a family of six children. Mary died and is buried in St Ninian's Parish Cemetery. Description: Square, felt covered. 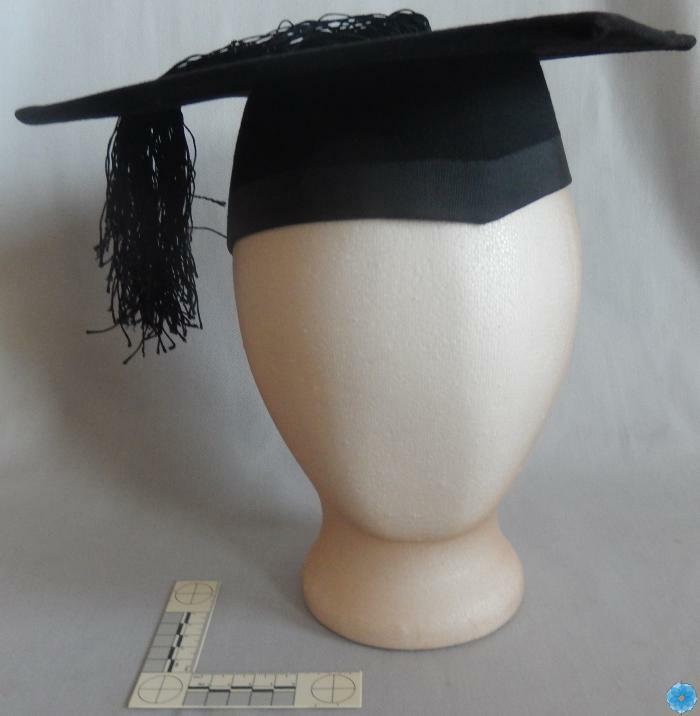 The mortarboard also has a black tassel 23cm long starting from the button. The skull cap is 22cm in length and 13 cm wide. It has black grosgrain trim 2.3 cm wide around the bottom of the skullcap, and the remainder of the outside is covered in black felt. Inside the skull cap there is black lining and there are several markings and labels. The cap is stored in its original cardboard box tied with a cotton tie.